The Mitsubishi Electric HyperCore® FH High Wall Heat Pumps are the true flagship of New Zealand heat pumps. With the best heating performance in cold conditions, HyperCore® technology guarantees you all the heat you need to combat extreme outdoor temperatures. While other heat pumps give less heat when outdoor temperatures reach 7°C, HyperCore® heat pumps uses its fully-rated capacity right down to -15°C. If you live in an area that experiences very low temperatures or very high humidity, the HyperCore® FH series is perfect for your home. Within the HyperCore® FH series are models for small, medium and large sized rooms. Contact us today to have a technician assess your space and advise which size is best. 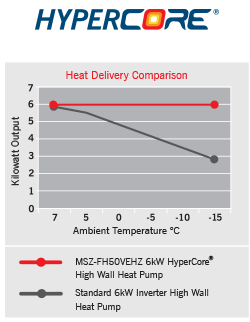 This graph shows the difference in performance of HyperCore® vs standard high wall heat pumps. Using a 6kW capacity in both models, you can see the comparison in heating delivery. The HyperCore® delivers the same level of heat regardless of outdoor temperatures, whilst the standard inverter high wall heat pump delivers less heat as outdoor temperatures drop. During winter, many areas of New Zealand are affected by frost. Frost occurs when the air at ground level drops below freezing point. In low temperature conditions, standard heat pump performance would deteriorate. The advanced technology of the HyperCore® FH series means you could have optimum heating performance when you need it most. The HyperCore® FH series are the only Mitsubishi Electric heat pumps that guarantee this high level of performance. 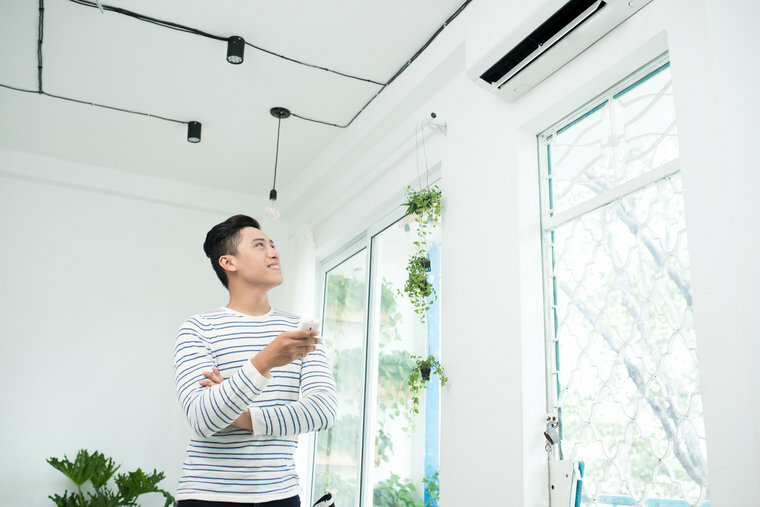 Have the latest in superior heat pump technology installed in your home. Contact us to find out more.